The young man kneeling is celebrating his 'freedom' - the end of his apprenticeship as a builder. In front of him on a table was a new hammer, a spirit level and some rope: gifts from the community to set him on his way. 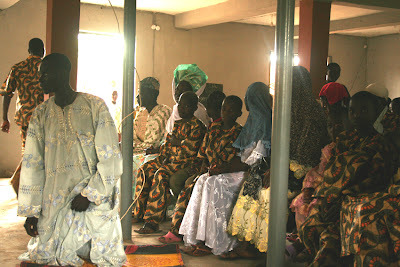 The event was multi-religious - christians and muslims alike had come together to mark his passage into the world. There are so many untold stories in Nigeria of how people come together across differences. It was a privilege to sit among these people for a while.